Pigs in blankets, made with organic free-range pork from Wiltshire. Succulent chipolatas with a crackle of seasoning, sweet nutmeg, rosemary and thyme, carefully wrapped in organic streaky bacon – with just the right marbling of fat to create those crispy, golden blankets. Porky perfection. Previously frozen – not suitable for home freezing. Delivered in insulated packaging to keep cool on your doorstep. Minimum meat order £15 to cover the cost of the packaging. 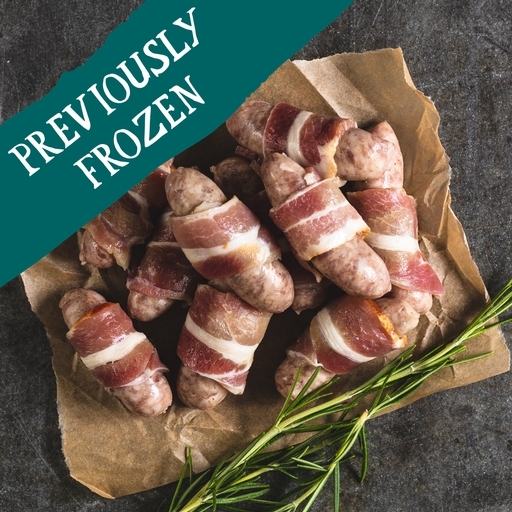 Our pigs in blankets have been previously frozen, so will not be suitable for home freezing. Remove all of the packaging and place on a foil-lined tray in a preheated oven at 180°C/Gas 4 for 20 mins, turning halfway through cooking. Previously frozen – not suitable for home freezing. The organic pork in our sausages and bacon comes from Helen Browning at Eastbrook Farm in Wiltshire. Helen set up her farm over 27 years ago. She’s a champion of organic farming and giving animals the best quality of life – in fact, she’s Chief Executive of the Soil Association and spends much of her time campaigning for better animal welfare. Helen’s organic breeding herd of 200 sows are pure British Saddlebacks – a native breed that thrive outdoors, make great mothers and produce great flavoured pork. Boars are Large Whites, a typical UK outdoor-reared cross. They counter the fat levels found in pure breed Saddlebacks, but not enough to change their special flavour. Chipolata sausages (pork (89%), water*, seasoning (breadcrumbs (wheat flour, yeast*, salt*), potato starch, sea salt*, ascorbic acid E300*, white pepper, ginger, sage, sugar, nutmeg, black pepper, thyme, rosemary extract), natural sheep s casings), streaky bacon (pork belly, sea salt*, sugar, sodium nitrite*).